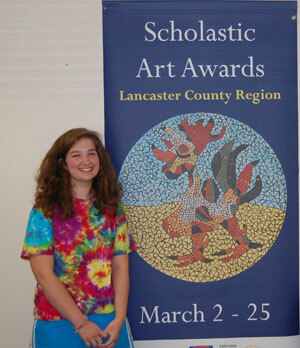 Penn Manor High School junior Kristen Longsderff created a ceramic piece featuring a rooster (pictured on the poster) and entered it in the Scholastic Art Awards and won a Gold Key award. The plate advanced in the competition and she was awarded a National Gold Key. Her work was then chosen for the National American Visions Medal which is awarded to only 5 student artists in the Eastern Region. She will be honored at a special awards ceremony on June 1 at Carnegie Hall. Her plate will be on display at Parsons School for Design in New York for the next year.